The hypersonic environment poses extreme technology challenges for aerospace vehicles that must withstand large aerodynamic loads in exorbitant and sustained thermal environments, requiring durability with minimal weight to achieve mission speed and range goals. Through collaborations with multiple federal agencies, including the Air Force Research Laboratory (AFRL), NASA, and the Department of Defense High PerformanceComputing Modernization Program, ATA Engineering (ATA) has been developing a suite of tools that fill a fundamental role in the design, modeling, and analysis of hypersonic vehicles. 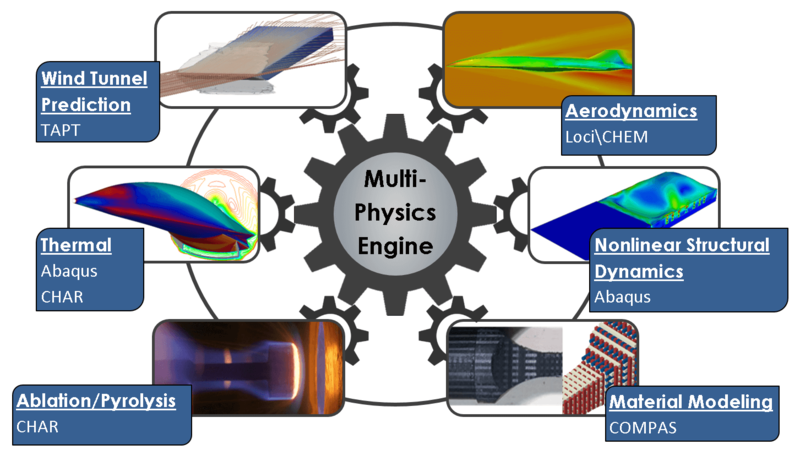 These tools include a multiphysics engine capable of coupling high-fidelity physics solvers to capture the complex fluid, thermal, structural, and thermochemical dynamics feedback occurring between the flight vehicle and the hypersonics environment; a material characterization tool that leverages machine learning to predict the performance of a range of composite materials typically used in hypersonic applications; and a tool that accurately predicts high-speed wind tunnel transient airloads acting on test articles to promote more efficient ground test campaigns and reduce risk to facilities and program budgets. Through support from the Air Force Research Laboratory Aerospace Systems Directorate (AFRL/RQH), ATA has developed a multiphysics simulation tool that incorporates mutual interactions between high speed aerothermodynamics and the structural response in high-fidelity, fully coupled aerothermoelastic simulations, which previously had been unattainable. Furthermore, with additional support from the AFRL Directed Energy Directorate (AFRL/RDLE), ATA has extended the multiphysics simulation capability and incorporated a material response solver to include the effects of ablation and pyrolysis. The multiphysics framework couples CHAR (a 3-D implicit charring ablator solver developed for thermal protection systems), Loci/CHEM (a computational fluid dynamics solver for high-speed chemically reacting flows), and Abaqus (a nonlinear structural dynamics solver) to create a fully coupled aerothermoelastic charring/ablative solver. The solvers are tightly coupled in a fully integrated fashion to resolve effects on the flow field from the ablation, pyrolysis, and charring processes yielding chemistry products, the induced aerodynamic heating identified through thermal-structural analysis of the body, and the changes in vehicle surface geometry due to recession and mechanical deformation caused by the flow field. The high temperatures present in the hypersonic environment necessitate the use of advanced heat-resistant materials such as carbon-carbon (C/C) and ceramic matrix composites (CMC) to provide the thermal protection. Designing with C/C and CMC materials is extremely challenging because the composites are macroscopically heterogeneous, possessing irregular phase geometries and high porosity (up to 30% by volume), and they exhibit nonlinear progressive damage behavior with several damage and failure modes across a wide temperature range. As part of an ongoing Small Business Innovation Research (SBIR) activity, ATA has developed and continues to develop a capability for nonlinear modeling of advanced composites such as 3D C/C materials. The resulting material modeling toolset includes two process flows: one for correlating a nonlinear material model to coupon-level test data, and another for performing progressive failure analysis at a structural/component level using the test-correlated material model. The tool has been utilized and validated on a range of materials including heritage 3D C/C composites, a 2D C/C laminate, and a 4D C/C-silicon carbide CMC material. Test articles in high-speed wind tunnels are subject to high-amplitude transient airloads. Current methods to estimate such airloads during startup/unstart or test article injection are simplistic and yield approximate or inaccurate predictions. The consequences of such inaccuracies can range from overly conservative ground test campaigns to catastrophic failures leading to test article or facility damage. Through the support of the Air Force Office of Scientific Research (AFOSR), ATA has developed a tool that produces high-fidelity transient airload predictions in startup/unstart and test article injection scenarios. The tool is extensible to any wind tunnel facility and test article geometry and is designed to be utilized by analysts, wind tunnel operators, and model designers. Its ease of use and high-fidelity airload predictions, make this novel tool a fundamental instrument for the ground test planning and test article design process. Reveles, N.D., R.S. Miskovish, and E.L. Blades. "A Closely Integrated Fluid/Solid Framework with Chemistry for Hypersonic Ablating Vehicles"National Space and Missile Symposium, Chantilly, VA, 2015. Blades, E., S. Miskovich, P. Shah, and E. Luke. "A Coupled Multiphysics Analysis for Hypersonic Vehicle"Proceedings of the NASA Thermal and Fluids Workshop, 2010.